I just finished a pretty cool book called “Factfulness“. It essentially presents a summary of the current state of the world from the big picture perspective with broad categories of income, education, and health. It deep dives into how misunderstood the world is by the masses, how biased is our outlook of the world, and the main reasons why we are so wrong. An average person continues to have an outdated mindset about the world and assumes that things are much worse than they really are. However, the reality is that the world is an incredibly better place than it was even as recently as 40 years ago. The book begins with a 13 question quiz and the results he has collected over the years are downright abysmal. The majority get only three out of 13 right! (I got 10 out of 13 but I am an optimist and basically, if you picked the optimistic answer, you were right most of the time). It did not matter how well educated the test takers were, what country they came from, or what profession. Not a single group of people that were polled beat out random guessing. 15% of test takers scored zero! Bashing media was not one of the goals of the books, but it came up rather frequently when the author dived into the reasons why the population continues to be so disconnected from the reality. Our worldview is being updated by us reading the news. And news, especially in today’s world, are not interested in keeping us educated. The goal is to shock, entangle, and keep on coming back for more articles that shock, entice fear, and further cloud our thinking. The news is not the same as it used to be. The amount of articles is ever growing and is insanely high today. The same story is distracted seemingly millions of times from various angles. So much fluff and irrelevant commentary. Media has had years of training on how to capture our attention with headlines and article structure. Keep the stories shocking, latch on to people’s fears, capitalize on uncertainty and our biological wiring. I can’t blame the writers. Their goal is to make money. How do you make money? By building audience and traffic and nothing generates traffic more than attention-grabbing headlines and shocking articles. The goal is not to educate or report the truth without embellishments or conjecture. I honestly believe we are far better off leaving the major media outlets. The negatives far out weight the positives of following the information flow. Last year many of us said we will leave social networks such as Facebook (although not sure how many actually did). I went through with the departure and could not love it more. Couple months back I have started to cut out my consumption of news in general and it’s been refreshing. This book is making me think that I should do more and go deeper with the clearance. The first thing I did after finishing the book is clear out my featured section for google assistance app on the phone. Previously it suggested news articles, and honestly, I visited that page at least 5-6 times a day. No more. Gone. That was the only news outlet that I let myself visit, and now it’s empty. I am sure I will need to replace it with something, but for now, I want to see how far I can go without any news dropped on my lap. I have a feeling that what I will replace will be specific blogs or authors and that’s about it. Let’s see how this experiment will go. Principles: Life and Work – Ray Dalio shares his core principles for various areas of life. It was excellent, causing me to blog about the book and the author’s way of explaining the expected value calculations. Happiness by Design: Change What You Do, Not How You Think – a somewhat typical self-help book that gives advice on how to live a happier life. The main idea was that happiness comes from having pleasure and purpose and there are ways to increase the amount of each with various advice on how to do so. Skin in the Game: Hidden Asymmetries in Daily Life I am a big fan of Nassim Taleb and this book did not disappoint. I can’t summarize the book in a single theme as his touches a large variety of topics, as usually is the case. Most of it is around the probability of events, the importance of understanding probabilities and causes if you are going to make decisions for the future. And of course, the usual Nassim’s digs at journalists and academics that don’t avoid work in the real world. Designing Bots: Creating Conversational Experiences – this book was meh, a summarize of what it takes to design a bot and some tips. Practical Monitoring: Effective Strategies for the Real World – I was very disappointed in this book, a very surface level treatment of what it means to monitor software systems. Domain Modeling Made Functional: Tackle Software Complexity with Domain-Driven Design and F# – an excellent discussion around modeling real-world domains in software, really loved this book and blogged about it here. Accelerate: The Science of Lean Software and DevOps: Building and Scaling High Performing Technology Organizations – a very good albeit high-level overview of what makes tech teams great. Everybody Lies: Big Data, New Data, and What the Internet Can Tell Us About Who We Really Are – a very entertaining exploration of what people post on social networks vs what they search using search engines, fake vs real so to speak. And the difference is hilarious. My favorite part was the comparison of what wives posted on social networks about their best husbands vs what they searched. Social network: my husband is my best friend. Search: is my husband gay? Implementing Domain-Driven Design – I went on a bit of a domain driven design binge around May and it started with this book. I thought it contained excellent code samples and explained the majority of the topics in a clear fashion. Ego Is the Enemy – this was a good reminder of focusing on your work and goals and ignoring the desire to get fame and recognition. It’s a tough balance to achieve as recognition can serve as a source of energy to continue going and working hard but ultimately the book is right: recognition is fleeting and often fake, find the reward somewhere else. Nine Algorithms That Changed the Future: The Ingenious Ideas That Drive Today’s Computers – it was a decent summary of things like encryption, compression, etc. Designing Distributed Systems: Patterns and Paradigms for Scalable, Reliable Services – I had high hopes for this one and was very much disappointed. It was basically a collection of patterns expressed via Kubernetes templates, boring. Writing High-Performance .NET Code – I picked this one up after somebody I know mentioned it on twitter, it provides an excellent insight into troubleshooting and writing fast performing software. Getting to Us – as is the case almost everywhere, eventually I pick up sports books and get my sports reading binge going. This one summarized several high profile coaches and profiled what were the key things they did with their teams to achieve success. Gridiron Genius – continuing the sports reads, this was a book by a football scout and front office executive that worked with Bill Walsh, Bill Belichik, and Al Davis and shared some of this thoughts and stories on leadership and successful team execution. Python Machine Learning Cookbook – had very low expectations for this book and instead was pleasantly surprised. I would consider this a must-have if you are doing machine learning with Python. A good guide to solving a variety of problems and can serve as a way to get surface level info on a topic before diving in deep somewhere else. Algorithms of the Intelligent Web – Ideas on how you could make the software more intelligent (user recommendations, machine learning, search, etc). The topic sounds good but the book itself is not detail enough to be useful. The Master Algorithm – I consider this a must read if you have started with Machine Learning applications. The author does an excellent job dissecting the history of machine learning techniques and tries to anticipate what is the holy grail/final frontier for the machine learning industry. I absolutely loved this book and how it walks the reader through the history while tying all the different pieces together and explains what is happening in machine learning today. The Site Reliability Workbook – a follow up to highly regarded, “The Site Reliability” book, very disappointing to be honest. Maybe my expectations were too high? I recommend skipping this book if you are considering reading it. Building Algorithmic Trading Systems – I got this book to learn some of the tips and tricks for building a sports betting system. I felt like there are some parallels between sports event and betting on them and the stock/futures market and betting on those. Definitely got some good insight on how to evaluate the prediction systems, I think that’s where I found it the most useful. When – lukewarm about this one, perhaps because most of the material it presents I’ve heard it before. Kids Are Worth It! – I read one or two books per year usually on raising children, just to get some ideas and thoughts on dealing with the little ones (have three of them in my house). I thought the author was too conservative, but eventually, I came around and loved this book. A lot of very practical advice on dealing with children issues from the time they are two to until they go to high school. Dopesick – The information presented inside is very powerful and paints a detailed picture of how prescription medicine addiction comes around and leads to other drug use and the demise of communities and institutions. Eye-opening information on how pharma industry played a critical role in introducing painkiller addiction to the masses and how the rest of the system furthered it along into an epidemic that you hear about today. Bad Blood – two words: READ IT! I really enjoyed reading Domain Modeling Made Functional, an excellent intro to modeling and implementing software requirements using a functional language (F#) with Domain Driven Design (DDD) principles. I don’t use F# (but appreciate functional programming in general) and the reason why I picked this book up is to learn and revisit DDD concepts. The first two chapters of the book were the most valuable. The main takeaway: when doing DDD, start with the events and not domain objects! I know that when I approach a problem, I always start with trying to define the domain objects. This seemingly small switch to focus on events instead felt profound as I was reading the first few chapters. The biggest value that software gives to its users is not in the domain objects it stores and retrieves, but in the transformation of the input data through the domain, usually via workflows which are triggered by … events! Identifying the events will give you a good idea of possible workflows that either exist or will need to exist which then lead to defining commands, bounded context, domain objects, aggregates, etc. It all starts with events. The process of identifying the events occurs during the eventstorming sessions (a good intro here). Eventstorming unites implementers and business users together as they work on defining the events, commands, and bounded contexts. Pulling people together during this phase is a great way to make sure that as little as possible gets lost in translation when somebody takes the requirements and then “translates” them to the implementation group. Instead, implementers are active participants that learn and define things together with the users. A domain event is the starting point, always termed in the past as it has occurred and cannot be changed. Eg. user created, user added, etc. Events can start workflows which then end with usually another event that other contexts can subscribe to and act upon. And then the rest of the book was more around F# approach to design and implementation. Several rules stand out, such as: avoid names and concepts that are not directly described by domain experts; build the smallest units, functions, that do the work, connect the functions to form services. Connect the services as pipelines to form workflows. Really neat book. Even if you don’t use F#, this books introduces many great concepts and if you don’t dabble much in DDD space, gives you topics about DDD that you can then go and explore on your own. I am in the process of reading “Principles: Life and Work” by Ray Dalio. Overall the book is very good and informative but one chapter really caught my attention: Learn How to Make Decisions Effectively. In particular, what stood out there was the author’s explanation of making decisions as expected value calculations. EV greater than zero can be thought as a winning decision and if you have multiple choices, pick one that has the highest expected value. A quick example from the book: let’s say the reward for being right is 100$ and the chance of you being right is 60% (0.6). The penalty is also $100 dollars (and the probability is 0.4 arrive at 1-0.6). Then EV = 0.6 * 100 – 0.4 * 100 = +20. This simple example is all well and good but check out couple thoughts now to branch out further. The best bet is not always a bet with the highest probability. If something is very probably but has a small positive outcome and very large negative outcome, the EV is negative. A decision can have a relatively small chance of success but if the payoff is much larger than the cost if you fail, that decision has a positive EV and is the right choice as long as you can cover the loss. This is where investments in risky but highly rewarding endeavors can pay off greatly. Again, as long as you can cover the losses. If you stick to “playing” with EV positive outcomes, over time you will come on top. The key is to make sure you have a good information and feel for the event’s probabilities and costs. What’s cool is that when taking an action or making a decision, you have four things that you can leverage to increase your EV: increase your chance of success, increase your positive outcome, decrease the chance of failure, decrease the penalty. Not always all four are malleable but you would be surprised how often there are other options to consider that increase the expected value. Following such thought process teaches your brain to search for alternatives that influence the four factors I just mentioned. Furthermore, when you start searching for different options with better odds, the actual odd value is less important than knowing that the decision you are picking is either less risky (you are decreasing the chance of failure) than the previous one or is more rewarding, etc. Now whenever I am working on let’s say a feature release, I consider expected value formula and ask myself: what’s my confidence level that what I am releasing will work correctly? In my profession (software) this is often tied to proper and extensive testing and validation. If I get a feeling that I could have done more testing, I right away do so to increase the chance of success. If the release goes wrong, what is the worst that can happen? This often makes me re-evaluate the size and scope of the release and if possible I break things up into smaller pieces which means the impact of a negative outcome will be smaller. I am continuing to dig and have thought exercises with this rule but so far it has been very beneficial. Absolutely loved the book and its main messages. It’s deep, ambitious, and very thought provoking. It was an immense pleasure to read. Term “Antifragile”. As defined by the author, antifragile is something that benefits from random events, somebody that gets stronger when stress is applied to it. This is a step above “robust” where robust most often means ability to deal with stress. Love it as a concept. Netflix’s Chaos Monkey seems to be something that you could define as a tool of antifragility. By randomly killing cloud instances, it helped Netflix build a more resilient architecture that now survives all kinds of cloud service failures. It actually gains from AWS going out as the rest of the services scramble, they stand strong and get positive press, admiration, tech fans that want to work there, etc. Evolution is another example. Individual participants (a human, animal) dies and disappears but the concept of genome continues to survive and actually gets stronger as individual members experience stressors that take out the weak and let the strong survive. Barbell strategy, a way to build antifragility. There are many ways to explain this strategy, but it boils down to playing majority of the time safe, and be very aggressive otherwise. NO MIDDLE GAME. Playing safe you are not exposing yourself to destructive events that could take you out, so to speak. At the same time, if you truly pick a smart but aggressive investment or activity, since it’s loss magnitude is small, even if all of it disappears – that’s just a small percentage lost. But if you hit “gold”, you benefit greatly. The key is finding an activity/investment that has such a great upside and whose downside is small. Seems obvious at first, but I think in real life we play mostly in the middle. Very little on the safe side, very little on the risky side and fat column in the middle. This thought is really nagging at me and making me reconsider many of my own activities and actions. Optionality, another way to build antifragility. When you have little or no options, you are limited in your actions and when you have no options, a catastrophic event can wipe you out. You don’t get better when Black Swans hit, you either suffer greatly, or survive. Options can enhance you ability to benefit from the Black Swan. Via Negativa. Another way to increase antifragility, as well as a way to look at life. Don’t try to add, but work hard to remove. When looking at a design of the systems, adding functionality adds complexity, which adds fragility. Simplify, remove it, and remove some more. A noble goal in any profession and in life. It’s something that is really hard to do as adding can be tempting and short-term gratifying. Also, rarely did anybody receives an award for not doing something. Bigger/complicated systems seem to hide failures underneath the surface and it eventually all comes out in a large (Black Swan) event that has catastrophic repercussions. Large governments, top-down as opposed to bottom-up, are inflexible, fragile, and susceptible to large crises. Think of how much infrastructure and layers of bureaucracy that exist within large governments and corporations. When you get an inside look, the picture is not pretty. According to the author, such setups are just a matter of time before they get hit with a Black Swan event that can wipe them out. At the very least many people suffer. Lindy effect. The longer the technology is around, the longer it will survive. Another way to spin it, don’t trust something that is new because by the mere fact that it is new, it has a really high probability not sticking around. Skin in the game. A large topic but it boils down to an idea that don’t listen/rely on somebody who is not impacted by whatever they are saying or asking you to do. A doctor that suggests you a procedure which he himself would never under go (e.g. risky back surgery), an investment advice from somebody that does not use it themselves. These appear to be obvious but are not obvious in real life. There are a ton of forecasters and prediction people that get things wrong all the time, their false forecasts or news being used in real life with negative consequences. Yet the forecaster suffers no consequences. That’s the reality of the modern world. We are too large, too big, we seek out commentators on anything and everything and then follow them without asking if that person has anything in it or just spewing nonsense for profit and moving on. In general, the book praises the life of stoicism, small size, and simplicity, suggesting the reader looks at Mother Nature, the most antifragile thing that we know of, for clues on how to live and advance. I love this book so much that I will buy a print copy to refer to from time to time. As a side note, I found it fascinating to see how many people absolutely deplore the author and this book. I can see how the ideas can be unsettling, and the author’s style is rather rude. I actually like it, no sugar coating and straight to the point. If you are offended by it, move on. The message is simply not for you. I wish I had read this book sooner. I found it very useful, despite its unusual, parable-like, story style. The stories teach the reader how to achieve financial success. Even though the setting is ancient times, the advice conveyed is very practical and applies today as well. When we think about “financial success,” we often think of immediate and big gains: stocks that multiple overnight, big payday, bonus, etc. The reality is quite different: financial success comes to those that work hard and smart, plan for it, and then take patient and steady approach. 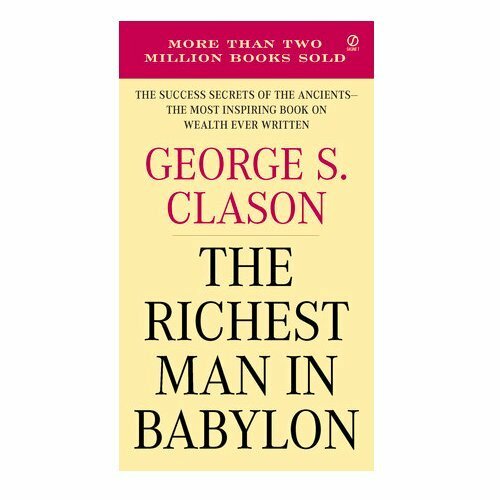 The book, which was written in the 1920s by an American author, shares stories that are mostly about a wise man Arkad and how he achieved financial wellness. Once you have a nice amount of money saved up, don’t keep it idle but instead make it work for you. i.e., invest it somewhere so it earns money. Invest it wisely, don’t invest in the areas you don’t understand without an expert guiding your way. Make sure you can get the principal back safely. Increase your capacity to earn by acquiring skills and knowledge. Now you could argue with some of the points here, but the principles in general are very sound. Save part your income, don’t spend lavishly, then start investing and get back principal AND interest, while keeping insurance around and all the time seeking for ways to improve your ability to earn. Can’t go wrong with that. Some of the other things that caught my eye were around how you go about saving money. When you start to save, don’t go crazy and frugal to the max, just make sure you start with 10% savings, and that’s a good enough start. However do analyze your spending and see if there are expenses there that can be cut (but again, within reason). Sometimes we forget subscriptions/services that we keep, and perhaps those can be avoided. And one of my favorite: “Opportunity is a haughty goddess who wastes no time with those who are unprepared.” When the opportunity comes, those that take it benefit, and to take it you have to be ready – you just never know when it will come.